getcalc.com's Variance calculator, formulas & work with step by step calculation to measure or estimate the variability of population (σ²) or sample (s²) data distribution from its mean in statistical experiments. The calculator is an online statistics & probability tool featured to generate the complete work with step by step calculation to help beginners to understand how to find the uncertainty in the observations or help grade school students to solve the population & sample variance worksheet problems by just changing the input values. Variance is a mathematical function or method used in the context of probability & statistics, represents linear variability of whole elements in a population or sample data distribution from its mean or central location in statistical experiments. The mean is the common behavior of the sample or population data. The smaller variance indicates that the most of the data closely distributed around its mean. The large variability indicates that most of the data distributed far from its mean. The measure of variability of finite population data is called population variance, often denoted by σ2 and the measure of variability of sample data to estimate the population variance is called sample variance or point estimate of population variance, often denoted by s2. 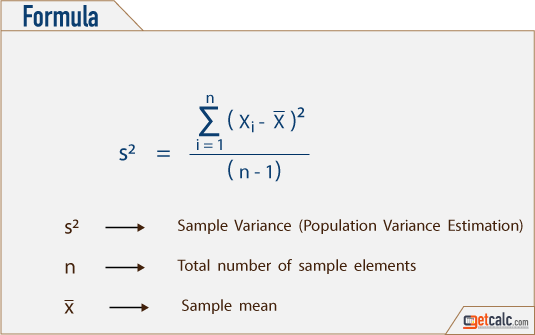 The sample variance is most frequently used method in statistical experiments which deals with infinite amount of population data. The population variance generally involves in the finite amount of data which describes how close the actual results to the expected results of statistical surveys or experiments. The major applications are to model, design, test, analyze & summarize the population distribution like online orders, sales of goods etc. Whereas, the sample variance is used to estimate the variability or uncertainty of infinite amount of population, generally used in chemical process, analyzing the strength of materials etc. Use this variance calculator to summarize the data or generate the complete work with step by step calculation for different collection of data. 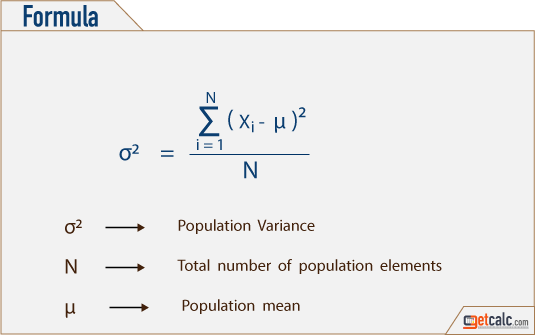 The below formulas are the mathematical representation for population or sample data distribution to measure or estimate the variability from its mean. Apply the values of individual observations, mean & number of elements or members in the sample or population data set in the below formulas or in the calculator to find how far the data values are distributed around the mean.